You've finished your spring cleaning, but clean just isn't enough. You're ready for a new look, but your wallet isn't ready to spring for a house full of new furniture or even a room of new furniture. Giving your home a new look doesn't have to cost a fortune. Here are six decorating tips that will fit any budget (or lack of budget). Move it all around: Before you buy new furniture, shift what you have around. Float the sofa grouping in the room on an angle. Bring that small chest out of the bedroom to use as a television stand. Swap rugs and accent pillows from different rooms. Combine lamps from several areas so that the lamps in the rooms don't match. Everything doesn't have to be symmetrical or match! Choose a healthy paint: One of the simplest and least expensive ways to create a new look is by painting. Even adding one or two accent walls to a room will make a big difference. Be sure to choose a no-VOC paint and avoid that awful "new paint" smell. VOCs or volatile organic compounds are toxic chemicals that off gas easily and can cause everything from scratchy throats to cancer. I designed and furnished this girl's bedroom with designer Lisa Reeves as part of Habispaces, a pro bono project where the two of us designed bedrooms for kids who were going to live in houses rehabbed by Habitat for Humanity Tucson. 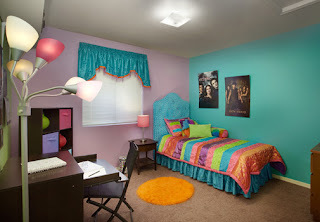 The girl asked for a room with walls painted in four different colors. The colors are based on a tie-dyed pillow that she owned. Change the accessories: The little things do make a difference. Reduce your accessories and clutter for a cleaner look. If moving your existing accessories around doesn't make a difference, visit thrift stores and yard sales for inexpensive pillows, lamps, rugs, dishes, artwork and other accessories. Add plants to animate the space and help purify the air. Don't toss it, update it: Durable furniture is inherently green, but at some point, you may get tired of looking at the same furniture, even if it is in good shape. You can slipcover upholstered furniture to change your style and color scheme. 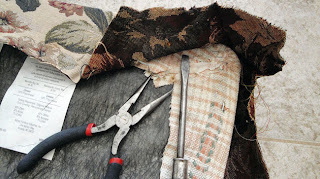 The seats on upholstered dining chairs can be easily reupholstered with inexpensive fabric. Existing wood furniture and cabinetry can be refinished and re-stained with water-based finishes or painted with no-VOC paint. Use used furniture: Selecting used furniture is a great way to decorate since it keeps furniture out of the landfill. If your used or new furniture has exposed plywood or particle board, seal it with a zero-VOC furniture sealant to reduce the off gassing of urea formaldehyde, a carcinogen. Make it new: Even if you want to use new furnishings, you don't have to buy everything at once. The important thing is to have a plan. Develop a furniture floor plan, a color palette and a style for your home, and then select individual, new pieces that fit your plan. If you just buy a piece here and there without thinking of the look you want in the end, you can end up with a hodgepodge rather than a coherent or stylishly eclectic look.